Hey Nancy, I love you:) Any comment? Members of the US House Armed Services Committee have voted to create a "Space Corps," a sixth branch of the country’s armed forces focused on military maneuvers beyond the Earth’s atmosphere. The space corps, which has yet to gain full approval, would absorb all of the Air Force’s current space missions under the umbrella of a new US Space Command. It would also make the head of the new service the eighth member of the Joint Chiefs of Staff. The plan, which could be implemented as soon as January 2019, has been developed as part of a radical reorganization of the US Air Force. The plan, which could be implemented as soon as January 2019, has been developed as part of a radical reorganization of the Air Force. Accepted. Will add the new NASA mission change too, as it relates. Starship troopers: US to create ‘space corps’ in radical Air Force overhaul. Members of the US House Armed Services Committee have voted to create a "Space Corps," a sixth branch of the country’s armed forces focused on military maneuvers beyond the Earth’s atmosphere. The space corps, which has yet to gain full approval, would absorb all of the Air Force’s current space missions under the umbrella of a new US Space Command. It would also make the head of the new service the eighth member of the Joint Chiefs of Staff. The plan, which could be implemented as soon as January 2019, has been developed as part of a radical reorganization of the US Air Force. SpaceX, the upstart company, and NASA, the government agency, both have plans to venture to Mars and orbit the moon. But that doesn’t mean they’ve launched a new space race. NASA has long been SpaceX’s most important customer, providing contracts to deliver cargo and eventually astronauts to the International Space Station. And the Hawthorne company will need NASA’s technical support to achieve the first of its grand ambitions in deep space. Blue Origin has also pitched NASA on a public-private partnership to fly cargo and science experiments to the surface of the moon, a mission it has dubbed Blue Moon. This year, it plans to begin crewed test flights of its suborbital New Shepard rocket. By next year, it could start flying paying tourists on trips that would cross the 62-mile barrier that’s considered the edge of space. December 1, 2010. The Russian space agency is going ahead with a plan to spend $2 billion to clean up space debris. December 9, 2016. Scientists at the Japan Aerospace Exploration Agency (JAXA) are experimenting with a tether to pull junk out of orbit around Earth, clearing up tonnes of space clutter including cast-off equipment from old satellites and pieces of rocket. Researchers are using a so-called electrodynamic tether made from thin wires of stainless steel and aluminium. The idea is that one end of the strip will be attached to debris which can damage working equipment—there are hundreds of collisions every year. The project, led by Moscow State Mechanical Engineering University (MAMI), raised more than $30,000 on Russian crowdfunding website Boomstarter. Mayak’s only mission is to be bright and remove defunct satellites from earth’s orbit. The space agency announced plans to redirect the course of a small asteroid approaching Earth, as part of the Double Asteroid Redirection Test (DART). DART would be NASA's first mission to demonstrate what's known as the kinetic impactor technique - striking the asteroid to shift its orbit - to defend against a potential future asteroid impact. DART launch set for October 2022. A new focus on space has emerged from both a US Air Force reorganization and NASA mission statements. The US Air Force is splitting off its space functions into a new Space Corps, to take effect in 2019. Congress added the “search for life” to NASA’s mission statement when approving the 2017 budget. NASA is increasingly partnering with Musk’s Space X and may partner with Bezos’ Blue Origin in their desire to go to the Moon and Mars. Then there is the press to clean up the space junk circling Earth, already in operation, and to find an effective means of deflecting asteroids heading toward Earth. This of course relates to the creeping disclosure over the alien presence on Earth. But the agenda also includes boosting US prestige which has suffered due to budget cuts over the past few years. The US hopes to be seen as a leader, or at least in partnership with the leaders. This is also an exercise in futility. We have stressed that the elite will not be allowed to ride out the Pole Shift on Mars or the Moon, and the Council of Worlds has enforced that decree. over one another will fail. During the Pole Shift, and well before hand, the Earth will be lashed by the debris ridden tail of Nibiru, tearing the satellites out of the sky and hammering hail and boulders upon the hapless Earth. Thus all maneuvers to get to Mars or the Moon are fantasies of the elite. And all maneuvers by the US to posture are to “make America great again”, and nothing more. 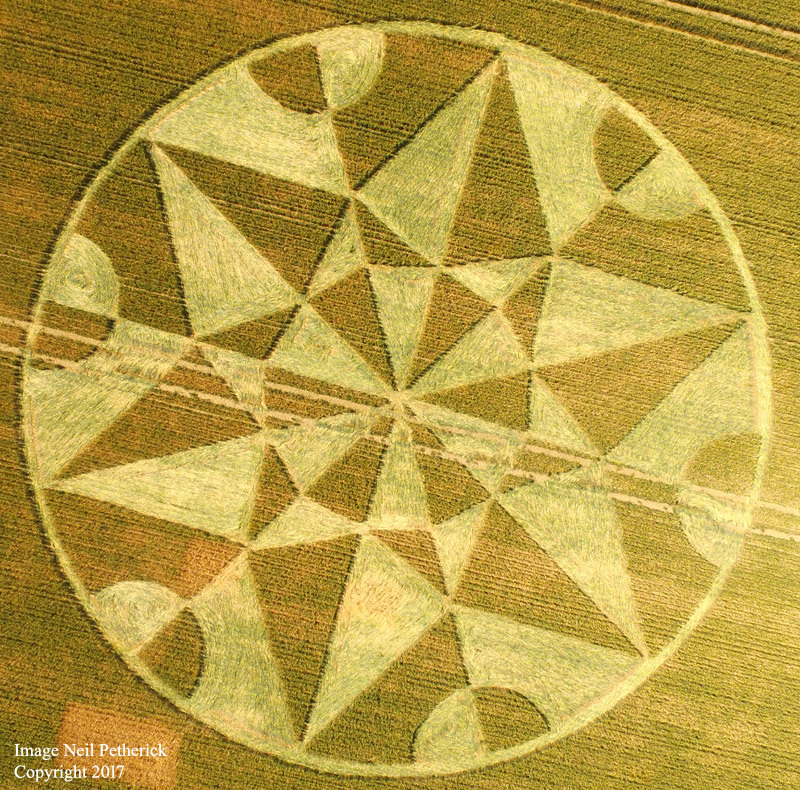 Crop Circle july 5 2017, Battlebury Hill, Wiltshire, UK. Can the Zetas comment? Montana earthquake related to Yellowstone? A magnitude 5.8 earthquake hit just after midnight about 6 miles southeast of Lincoln. There were no immediate reports of injuries. Residents in Lincoln briefly lost power and there was a gas leak in Helena. People felt the quake as far away as Bozeman, Idaho, and Great Falls. A 5.8 magnitude earthquake struck western Montana around 12:30 am. The shaking was felt as far away as 500 miles. The spate of Montana quakes on July 6 had nothing to do with Yellowstone, nor with the pending ripping of the New Madrid Fault Line or adjustments along the San Andreas Fault Line. Due to the bowing stress the N American Plate has been enduring, pulling the continent in a diagonal direction, rock strata throughout the continent are put under stress. Lincoln, Montana lies just inside the rock strata that has been pushed over the plains during past Pole Shifts. This is a SEPARATE strata, not homogeneous with the underlying rock strata of the plains, and thus they do not move as one. sinkholes in Pennsylvania, and fracturing Alabama pipelines. As the N American Continent is gradually pulled in a diagonal manner, the overriding rock strata at the edge of the plains will shatter when it is pulled away from the underlying plains strata. These are not deep quakes, but rather surface quakes, and should be expected to occur in the future. Declined as there is something wrong with this CC which does not seem genuine. The grain is crushed, not woven, and it has no message. It seems to be a fake trying to detract from a GENUINE CC in early June, which did have a message. Can the Zetas speak to the new land mass that has appeared off Cape Hatteras? Accepted. Just wobble sloshing result. Anything to do with the stronger seismic activity up and down the Atlantic Ridge? The sandy beach is littered with whale bones and ribs of old shipwrecks. It appeared out of nowhere in April just off North Carolina's Outer Banks—a new land mass poking through the surf, a brand new Atlantic Ocean island. It is not unusual for patches of ground to emerge and then quickly subside. These are, after all, some of North America's roughest waters, a shallow region of swirling tides, hidden shoals, and harsh winds known to sailors as the Graveyard of the Atlantic. Yet even for this place, this new formation is of a scale rarely seen. All this ferocious change comes to a head near Cape Point, which is just 10 miles or so from the edge of the continental shelf and the place where the Labrador and Gulf Stream meet. New land composed of debris and sand will emerge during the Pole Shift, due to the turmoil of sloshing and rising and falling ocean waters. River deltas form in this way, sediment carried down river settling when the flow relaxes. In a similar manner, strong tides can pick sediment up and force it afar, then drop it when the tides pause and reverse. More than dirt and sand are delivered in this manner. Anything that has been dragged out to sea, or sunk to the bottom, can re-emerge. This new land is not solid, and can again be washed away by rains or flood or storms. Hello Nancy and Zeta friends. I'm a long-time reader and supporter who has never commented on any personal experience -- but something happened last night that I cannot ignore. At 10:30 PM on Saturday (7/8) in Yukon, OK, located just west of Oklahoma City / Tinker AFB, my wife and I heard a steady, loud rumble emanating from the West that sounded like the whir or hum from a circling aircraft/chopper -- but was much too large to be anything commercial. At the same time to our East, loud zig-zags from unseen (objects?) very high in the sky scared the daylights out of us -- and caused animals underneath to emit the most terrifying screams/howls we'd ever heard. Again, the speed of whatever was causing these jet-like rumbling noises was much too fast to be anything commercial. We thought WW3 was breaking out, and we were most unnerved that we could not see ANYTHING. The unsettling noises continued for nearly 30 minutes and then abruptly stopped. Left shaken, we sought out other such incidents and found a video clip from Nottingham, UK, that sounded somewhat similar. My question, if the Zetas would care to address, is what exactly causes these mysterious and terrifying noises? Unseen aircraft? Screeching earth? Or are we just paranoid? Thank you for considering. Why has the Blue Whale game taken off? If the participants pass the challenges, then they get to commit suicide. What the heck? The Blue Whale Game or Blue Whale Challenge reportedly stems from an online social group where its administrators, referred to as 'Masters', issue tests to participants over the course of a 50-day challenge. To 'win' the game, the players are reportedly ordered to commit suicide. It has also been reported that those unwilling to follow the final order are told that their families will be killed. The game is also reportedly spread under several other names, such as 'I'm in the game', 'Wake me at 4:20', F57, 'A Quiet House/A Silent House', all via social hashtags. Initial reports of Blue Whale games originated from Russia where around 130 youth suicides between November 2015 and April 2016 have been linked to the deadly challenge. The alleged mastermind behind a suicide cult targeting vulnerable children through social media has been arrested in Russia. Ilya Sidorov, 26, is accused of encouraging youngsters to self-harm and kill themselves in a twisted game likened to the “Blue Whale challenge” that has been linked to more than 130 deaths. Children who join the game are told to cut themselves, watch horror films, and go without sleep as they carry out a series of “tasks” apparently aimed at damaging their mental health. On the 50th day of the “challenge” they are told to commit suicide. Mr Sidorov is said to have recruited up to 32 schoolchildren to his group before his dramatic arrest in Moscow. where a captive identifies with his captors, becoming part of the gang. Such bonding is common among street gangs, where the young person does not have a strong parent or guardian they identify with, so they seek others on the streets as role models. Street gangs will send new members out to kill someone in a rival gang. But killing the self is not the goal. The goal is to kill the enemy, or prove oneself loyal. Even fraternities, which are a type of cult, have initiations whereby the applicant must prove themselves worthy. These initiation rites often include risk and potential injury, but not death. Even Kamikaze bombers in Japan were carrying out an honor tradition - loyalty unto death. The Blue Whale cult has suicide as the GOAL. What would induce a young person to join such a cult, where the right to commit suicide is the prize? Suicide is available to these young people without such a permission, so why seek permission? At first, there seems little risk as control lies with the victim. He can always step away and refuse to continue the game, refuse to take the next challenge. Why does this become like a drug, where the longer one lingers, the more addicted one becomes? It is a psychological addiction where the convert feels better about themselves when in the cult, and feels empty when outside the cult. such as the Virginia Tech massacre, are by such applicants seeking future status. This was likewise a feature of the Slenderman atrocities. This episode was an example of a group possession, in which a group of weak individuals allows a strong Service-to-Self spirit to influence them. Unlike traditional possession where the possessing spirit remains in the human who has invited it and creates dramatic chaos and violence, these group possessions are low-key and often not recognized by others. The motives in the possessing spirits differ in these two scenarios. In group possession there is a different agenda, which is a slow erosion of the group so that only Service-to-Self behavior emerges. It is noteworthy that the Slender Man mythology centers around the Slender Man’s interaction with children, who are easily frightened and feel helpless to fight the adults in their lives, much less one who is tall, has many tentacles, and can appear and disappear at will. The Stockholm syndrome develops, whereby the helpless one embraces and wants to bond with their oppressor. The girls are not psychotic, though will likely be diagnosed as such, and did indeed have their dreams and thoughts influenced by the Slender Man entity. I'm a long-time reader and supporter who has never commented on any personal experience -- but something happened last night that I cannot ignore. At 10:30 PM on Saturday (7/8) in Yukon, OK, located just west of Oklahoma City / Tinker AFB, my wife and I heard a steady, loud rumble emanating from the West that sounded like the whir or hum from a circling aircraft/chopper -- but was much too large to be anything commercial. At the same time to our East, loud zig-zags from unseen (objects?) very high in the sky scared the daylights out of us -- and caused animals underneath to emit the most terrifying screams/howls we'd ever heard. Again, the speed of whatever was causing these jet-like rumbling noises was much too fast to be anything commercial. We thought WW3 was breaking out, and we were most unnerved that we could not see ANYTHING. The unsettling noises continued for nearly 30 minutes and then abruptly stopped. Left shaken, we sought out other such incidents and found a video clip from Nottingham, UK, that sounded somewhat similar. My question, if the Zetas would care to address, is what exactly causes these mysterious and terrifying noises? Unseen aircraft? Screeching earth? Or are we just paranoid? A loud "booming" noise has been heard above Nottingham and people are desperate to find out what it was. The unexplained noise has been described as a "roaring" and "rumbling" noise, which has happened every few minutes over night. mesmerized the world, vibrations in water reservoirs have caused tones or trumpeting sounds. When the basin is diverse the sound can emit as a howl, as in the Tampa Bay howl. The UK is being pulled apart, in many directions. Ireland and Wales are being pulled DOWN as the Atlantic is stretched taut, while the English Channel is being pulled apart. Nottingham, in the center of the land mass is being stretched and snapped. Being on a river, on crust that is thin and thus droops, it also vibrates, vibrating the air mass above Nottingham. Some popular Sun observers are claiming that government/s are employing Sun simulator/s to obscure or confuse actual solar activity and hide objects, potentially including Nibiru. is there truth to these claims regarding Sun simulator/s? One of the youtube channels frequently mentioning this is WSO. A solar simulator (also artificial sun) is a device that provides illumination approximating natural sunlight. The purpose of the solar simulator is to provide a controllable indoor test facility under laboratory conditions, used for the testing of solar cells, sun screen, plastics, and other materials and devices. Solar cycle 24 has seen very low solar activity thus far, likely the lowest in 100 years. NASA has deigned to give us another nine months of sunspot area data by hemisphere, up to September 2016. The fact that the hemispheric peaks of the last three cycles align indicate that there is a multi-decadal force operating in the vertical dimension. The chance that two sets of three points line up exactly by themselves is infinitesimal. June 11, 2017. A high-flying science experiment may color the skies above the U.S. mid-Atlantic coast with bluish green and red clouds on Sunday evening, as NASA seeks to learn more about charged particles at the top of Earth's atmosphere. The luminescent colors are due to sunlight interacting with the chemicals barium, strontium and cupric-oxide. Although the flight will last about eight minutes, the colorful clouds could linger for 20 minutes. Scientists want to learn more about how the ionosphere interacts with other layers of the atmosphere.